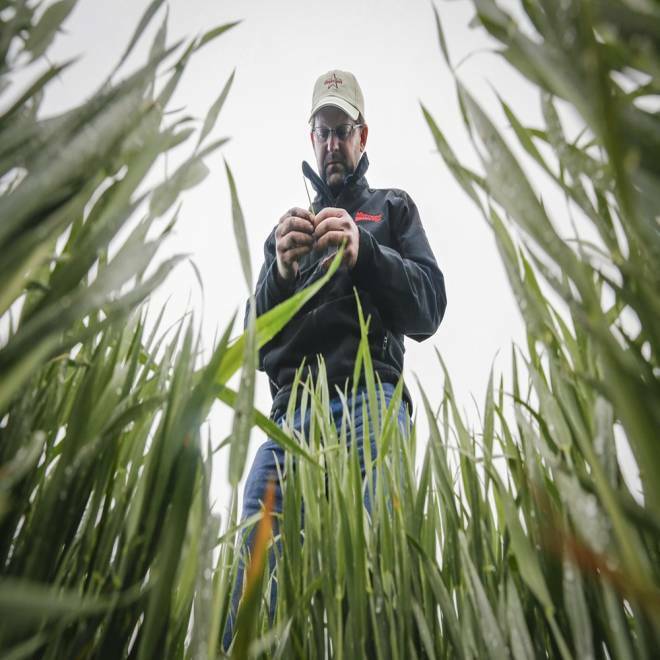 Ben McClure examines a wheat stalk in a Reno County, Kan., wheat field. Forecasts show a smaller crop due to drought and late-spring cold. The winter wheat crop is expected to be far smaller this season compared to last, particularly for hard red varieties used in bread, the U.S. Department of Agriculture reported Friday. In the first government projection on the harvest's anticipated size, the National Agricultural Statistics Service estimated winter wheat production will be down 10 percent to 1.49 billion bushels, due to fewer acres — 32.7 million acres, some 6 percent fewer acres than a year ago — and a 1.8-bushel decrease in average yields, to 45.4 bushels per acre. The government's forecast comes amid a season marked by drought and late spring freezes in the Midwest's major wheat growing areas, particularly in Kansas — the nation's biggest wheat-producing state. A Kansas farmer holds up a head of wheat that's forming in the stalk. Dean Stoskopf, who is growing 900 wheat acres near Hoisington in west-central Kansas, expects to have an average or below-normal crop because of all the dry weather. "We were fortunate enough to get some rains here, where not everybody did, but it is still a wait and see what we are going to end up with," Stoskopf said in a phone interview. His wheat greened up, but Stoskopf is mindful that there is no subsoil moisture to carry the crop to harvest if the weather turns hot and the rains stop. The wheat heads — where the kernels develop — have just emerged, meaning it will likely be July before Stoskopf can harvest if all goes well. "We have a ways to go before we have a wheat crop," he said. Nationwide production of hard red winter wheat, typically used to make bread, is expected to decline 23 percent to 768 million bushels. But that'll be offset somewhat by soft red winter wheat types — favored for cookies and pastries — which are projected to be up 19 percent at 501 million bushels. One bushel of wheat yields about 42 pounds of flour — enough to make 73 loaves of bread. Far western Kansas is considered a disaster area, and farmers told tour participants earlier this month that crop insurance agents have already begun writing off acres there. 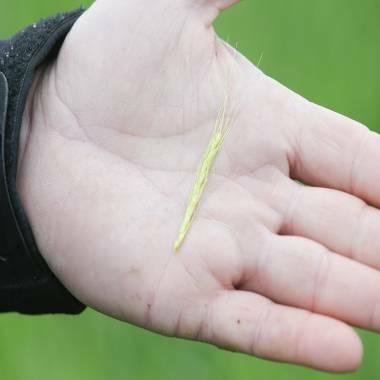 Wheat tour participants examined 570 fields, finding that in south-central Kansas, which got late winter snowstorms and heavy spring rains, the wheat looks good and production there is expected to offset a bit the losses elsewhere in the state.